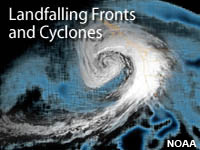 Landfalling cyclones and their attendant fronts significantly impact the structure of mesoscale wind and precipitation fields along the west coast of North America. This module focuses on the complex interaction of the wind field with topography and the resulting effects on nearshore winds and precipitation. For example, prefrontal conditions may lead to flow blocking, development of a barrier jet, and seaward displacement of the maximum precipitation. Postfrontal conditions tend to promote windward ridging and lee troughing, which enhance along-coast flow. Describe the conditions under which flow becomes blocked by topography. Given the wind speed, stability (Brunt-Vaisala Frequency), and mountain height, determine whether flow will be blocked by topography. Describe how the angle between a landfalling front and the coastline affects the flow/topography interaction. Describe how the prefrontal environment may experience enhanced stability. Describe the conditions that lead to formation of a barrier jet. Describe the change in the pressure field as cold fronts make landfall. Given a landfalling front under conditions conducive to flow blocking, describe the anticipated effects on the motion of the cold front, the wind field, and the precipitation field. Given a landfalling front under conditions that are not conducive to flow blocking, describe the anticipated effects on the motion of the cold front, the wind field, and the precipitation field. Describe the advantages in using a high-resolution model to forecast the effects of landfalling fronts, compared to lower-resolution models. July 2014: The concepts presented are good and relevant, but the module does contain old model data (i.e. the 40 km Eta) may not be representative of current operational models.